Here’s super-surgeon Peter Carroll, who has done the excellent research I talk about in the piece. I got the impression that he’s an exacting perfectionist numbers guy. Probably what you are looking for in someone whose handling a scalpel around your tender vitals. And here’s the other doc in the piece: Wells Shoemaker, pediatrician, big picture thinker and winemaker. Wonderful guy, fabulous in keeping the data in perspective with the larger goal of having as many people as possible live the richest and happiest lives as possible. I thought that he and Dr. Carroll worked well together. 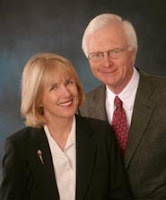 And here’s the insightful and thorough patient, John Shoemaker, (with his wife Donna). He happens to be a very smart and a successful businessman – they kind of person I’d trust to give me good advice. For patients, personal help to find a doctor or the correct urology clinic is available from the UCSF Medical Center at 888-689-UCSF (888-689-8273) Monday to Friday, 8 a.m. to 5 p.m. (PST) or by email at referral.center@ucsfmedctr.org.